Nina's main research interests are machine learning, computational aspects in economics and game theory, and algorithms. Her work develops deep new connections between these areas, using ideas and insights from each of them to solve some of their central and emerging challenges in innovative ways. Within machine learning, a major goal of her research is to develop foundations and algorithms for important modern learning paradigms. These include interactive learning, where the algorithm and the domain expert engage in a dialogue to facilitate more accurate learning from less data compared to the classic approach of passively observing labeled data; distributed learning, where a large dataset is distributed across multiple servers and the challenge lies in learning with limited communication; and multi-task learning, where the goal is to solve multiple related learning problems from less data by taking advantage of relationship among the learning tasks. Her goal is to provide new frameworks explaining the fundamental underlying principles, as well as new powerful, principled, and practical learning algorithms designed to satisfy the new types of constraints and challenges of these modern settings (including statistical efficiency, computational efficiency, noise tolerance, limited supervision or interaction, privacy, low communication, and incentives). At the intersection between machine learning and game theory, she is interested in developing tools for analyzing the overall behavior of complex systems in which multiple agents with limited information are selfishly adapting their behavior over time based on past experience. Within algorithms and optimization, she is interested in identifying models of computation beyond worst-case analysis, that accurately model real-world instances and could provide a useful alternative to traditional worst-case models in a broad range of optimization problems (including learning problems of extracting hidden information from data). Nina received her PhD from CMU in 2008. Her thesis on "New Theoretical Frameworks for Machine Learning" was awarded the CMU SCS Distinguished Dissertation Award. Her honors also include an NSF CAREER Award, a Microsoft Faculty Research Fellowship, a Sloan Research Fellowship, and several paper awards. 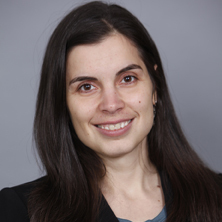 She has organized several workshops with interdisciplinary focus, and has been actively serving on important committees in Machine Learning and Theoretical Computer Science; most recently, she was Program Committee Chair for COLT 2014.